I find what is simple works best and while keeping my 4c hair tresses moisturized requires care, it’s definitely doable. 4C hair loves moisture and the more effectively it is moisturized the more manageable this hair type will be. Even though I know it’s hard being that 4c hair is high shrinkage, find ways to stretch your hair without resorting to heat all the time. Pineappling is the easiest and less time consuming way to do this. Sometimes of course stretching hair with heat is just going to be more convenient, but do so sparingly and carefully. Know when it is time for a wash. You may be tempted to not wash your hair as often to avoid over manipulation and dryness. However, over the course of the week especially if you go heavy on your products you will find that no matter how much product you use, your hair still seems dry. This is a sign that your hair has so much product buildup that is preventing your hair from receiving any moisture. Co-wash instead of shampooing all the time. You definitely will have to shampoo at some point to get all of the product buildup from off of your scalp, but you will most likely will have a less drying experience if you opt to co-wash.
Avoid using super hot water when you wash your hair as this can be drying. Wear protective styles to retain more moisture, of if you prefer your hair to be out more try using these tips: How to Grow Your Hair Without Protective Styling. If you haven’t seen my post, The Faux Wash n Go, you should definitely check it out. It gives you the appearance of a Wash n Go look without the time commitment that methods like the Maximum Hydration Method requires (we will get to this soon enough). There are two things that are a requirement for this method to work: hair must already be in an old style that produced curl definition (twist out, rod set, braid out etc.) and instead of washing your hair it’s more like a light rinse with water only or conditioner. 4c hair doesn’t have a defined pattern, but roller sets and braid out methods help you to achieve this. Which is why in order for this to work your hair must be curled. The light rinse give your hair the hydration it needs without stripping it completely of your hair’s oils. Thus far, I must say it has been keeping my hair hydrated and making it easy for me to rock my go to style, the classic high puff. It’s also pretty easy maintenance wise, being that I simply just moisturized my hair each morning smooth out my hair put it in a ponytail and go. Next week we will take a look at a more intense method for making 4c hair clump into luscious curls, and it is called the Max Hydration Method. Would this Faux Wash n Go style work on transitioning hair? 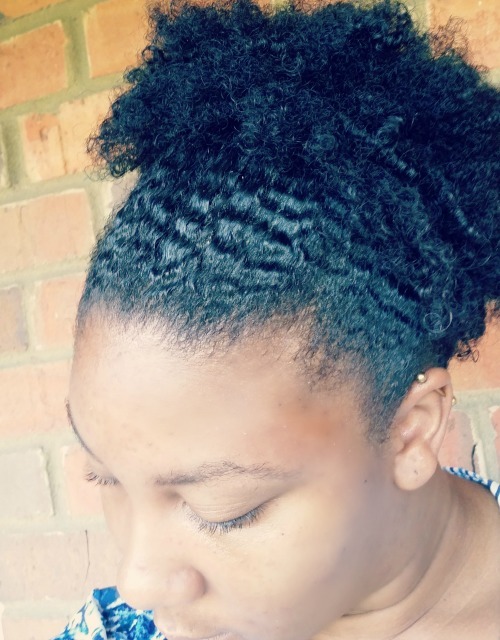 4c hair do have have a defined coil or zig zag pattern, if it is properly hydrated and/or not combed or brushed out which leads to frizzy undefined hair. I have 4c hair, and I have defined each and every coil on my head by using methods that encourage my maintaining high levels of hair hydration. I do not combs or brushes to detangle my hair. It is okay if someone chooses to use those tools. But then the coils or wave pattern will be combed out. All hair that is not straight has a defined curl, coil or wave pattern. I am a licenced cosmetologist and yes any hair texture that is not straight has a curl or wave pattern. The only difference in curl or wave pattern is the size if the curl or wave.